Pre-Race Prep / Race Check-in - I actually put a lot of effort in to pre-race preparations this year. I had never really utilized drop bags in any race I've run before. For GTR100, I not only put together two drop bags (one for the Base Aid Station, where I'd pass about 13 times, and one for Ski Hill Road). Not only did I have the drop bags, but I also bought two coolers. Last year I totally despised drinking Heed all day long. This year I packed the two coolers with Powerade, Red Bull and Starbucks Coffee drinks. Bob Gentile and I shared coolers (and he actually made use of my one crew member - my wife - but for CREWING ONLY), and he threw some Boost in there as well. The day before the race Bob, Ed and I headed back up the ski lift to the top of Fred's Mountain to hang in the high altitude for a bit, hit packet pick-up, met up with Eddie and Meredith for our own private pre-race dinner, then relaxed before hitting the sack. Typically I have trouble sleeping the night before a big race, and Friday night was no different. I finally decided to give up and roll out of bed at 3:30 AM. 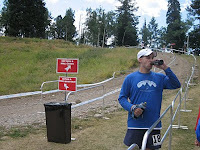 A breakfast bar and coffee were on the pre-race menu, and I even got in a quick on-line poker game to help relax. Bob knocked on the door at about 5:15 AM or so. We loaded the Ski Hill Road cooler into my rented mini-van (Ginette would make the trip to drop it off later) and carried our other cooler to the Base Aid Station. Pre-race check-in was more like social hour. 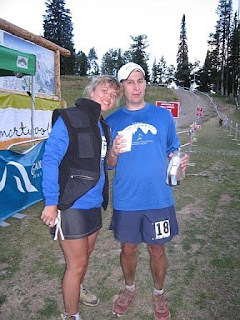 I spent some time with Mike Evans (he placed 5th in 2007, in his first 100 mile race) and Kira M. (a Badwater veteran). Loop # 1 (0 - 25 Miles) - Each loop starts off with a bang, an approximately 2,000 foot climb up Fred's Mountain. 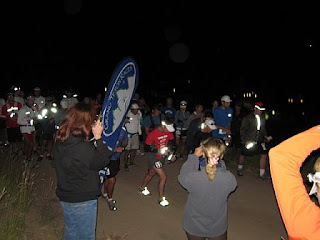 Adrenaline pushed most of the runners up the mountain in the early morning hours at a rapid pace. I spent most of the ascent with Kira and Bob, reaching the top in well under an hour. It isn't so much the climb up that gets you. The descent is quad absolutely quad jarring. 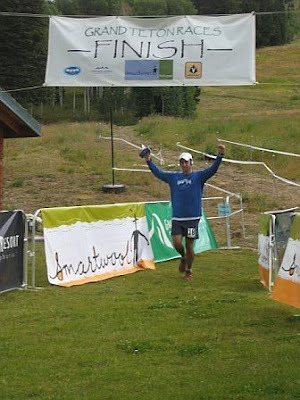 When I reached the aid station at the bottom in 1:17:15 (a good 9 minutes faster than last year), all felt well. Section B was no different. I continued to cruise, hiking hard on the uphills and running well on the flats (if there were any) and the downs. Bob was still hanging with me. 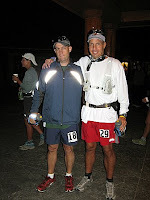 At some point along the way I started swapping places with Joe Prusaitis, the race director for the Rocky Raccoon 100 Mile Trail Run. I would learn that although Joe is legally blind and could not read a single road sign during our 3.2 mile climb up Ski Hill Road, he takes the down hills with remarkable ease and speed. He says it is because he figures he can't see anyway, so he just goes and feels it out. Sick ! On the way up Ski Hill Road I met two great guys from Utah, Matt Ward and Garrett White. 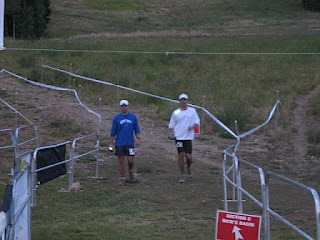 I would shuffle places with Matt for most of the race, until he withdrew at around the 75 mile mark. Garrett would eventually struggle greatly, but still finish under the 36-hour cut-off. After ascending Ski Hill Road the course takes a quick drop before starting its climb to the top of a ridge. The last climb to the top of the ridge is brutal, a switch-back from hell. Still feeling in great shape, I polished off the Mill Creek Trail in 3:13:45 (12 minutes faster than last year). Section C (Rick's Basin) was no different - 10 minutes faster than last year. As I completed the first loop I was torn in two directions - one part of me felt great, knowing that I was at 5:37:55 and in great shape, but another part felt as if I had perhaps pushed a little too hard. Loop #2 (26 - 50 Miles) - The second trip up Fred's Mountain was noticeably more difficult than the first. My breathing had become more rapid, my steps shorter and more labored. 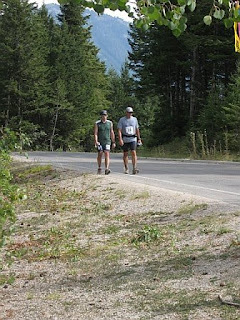 I was solo for the entire climb, making it difficult as I could not feed off other runners to get me moving. I was happy to see Ginette and the family waiting for me at the top, and that gave me an extra boost of energy. Actually, hitting the top of Fred's Mountain is an amazing feeling. 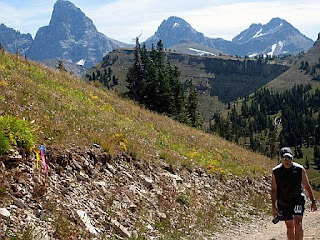 As you turn around at the aid station to begin the descent, a rush of energy hits you, knowing that it is all down hill for the next 2.8 miles. It took me almost 20 minutes longer to complete the Fred's Mountain section the second time around. The worst was yet to come. Section B was a disaster. It was here that my stomach began to cramp. The temperature rose. My caloric intake took a turn in the wrong direction. I was lucky to have Terry Madl to hang with for a portion of this section, a section that I would hike a great deal of. It took over an hour and a half longer to get through Section B this time around, but it was still faster than last year. I would constantly check on the progress of Meredith, Eddie and Bob as I passed the main aid station. And, as I finished up the first half of the race in 13:35, I learned that Kira and George (to injury) had withdrawn. At some point in the next several hours I would also learn that Meredith (to health issues) Eddie, and Bob would withdraw. This had somewhat of a depressing effect. Some portions of the course see two-way traffic, and it was always great to see friends, especially late at night. With nearly half of the total runners dropping at some point, the course became extremely lonely. Loop #3 (51 - 75 Miles) - Although it was not my worst time up Fred's Mountain in the race (it was last year, taking me 3 hours), the third trip up that #%@^@%# mountain was painful. But, after hitting the summit I knew that I had some help waiting for me at the bottom in the form of my wife, Ginette. She would start her 19 mile pacing duties (completing Sections B and C of my third loop), and boy was she a help. At some point we hooked up with Sergio (doing his first 100 mile race, all the way from Monterrey, Mexico), and the three of us spent the better part of the evening hiking our way through the woods. I was still faster in each segment of Loop #3 this year then I was last year, but still considerably slower then the first two times around. I thought that if I kept this loop to 9 hours, I'd have a chance to push in the final loop. Sure enough, I completed the third loop in 9:00:22, but my food intake was abysmal. For fourteen hours straight I was only able to consume one gel and soup. This lack of caloric intake would haunt me in the final loop. However, the evening hours did bring cooler temperatures, and with that renewed life. The heat of the day was gone, and that helped me to pick up the pace both on the runnable sections and the hikable sections. Ginette pushed us every step of the 19 miles, constantly making sure that Sergio and I were right behind her. I had mentioned that portions of the course see two-way traffic. Throughout the race I would run into Mike Evans. He was far ahead of me and finished in just under 28 hours. As we would pass we would offer each other words of encouragement. We were both experiencing difficulties, him more so then me. Yet, Mike pushed himself to the finish. Mike would come into play a little later in my race, offering me the final boost that drove me to the finish line. Loop #4 (76 - 100 Miles) - Back up this $%^$#$% mountain I go. The fourth and final climb was the most difficult part of the entire race. Forget about the elevation gain. Forget about the steep hills. Now it was the weather taking its toll. Sergio and I stuck together the entire climb. As we got higher and higher, the winds picked up and the rains pelted us. The rain turned to sleet and hail at times. For the first time I heard Sergio drop an f-bomb (which was kind of funny with his Mexican accent). We reached the aid station on top and things got worse weather wise. It was absolutely freezing up there. The wind was ripping through the aid station tent. Augie had a small heater that had no effect on my hands (which were covered by soaked gloves). The descent was equally brutal. Until we reaches some sheltered trail, the winds were hitting us head on. More f-bombs from Sergio. It was a relief to reach the bottom of the mountain, especially knowing that I had only 20 miles left to finish. I was consistent through Section B the final go around. Although each climb was more difficult then the last, I knew that once I made it back to the Base Aid Station I'd only have 5 miles to go. Oh, side note - on the way down Fred's Mountain we ran into the marathoners (they started at 7:00 AM). It was actually great to have their fresh legs out there. They were all very supportive of the 100-milers still on the course, offering words of encouragement. I was also happy to see that Larry and Olga and had moved from the Base Aid Station to Ski Hill Road - Olga is just awesome and an amazing motivator !!! During my traverse of Section B the leaders would catch me, and again provide more words of encouragement. 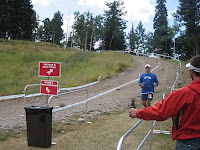 When I reached the Base Aid Station the first person to greet me was Mike Evans. Mike had finished and had a cold beer waiting for me. He gave me just one swig, saying that a full cold one was waiting for me 5 miles away. Lisa, who had been so supportive for the entire race gave me one last push and I was off to finish the last 5 miles. Looking at my watch I noticed that if I picked it up a bit I had a shot of coming in under 32 hours. Setting that as my goal, I pushed on, hitting the hills as best as I could, and running when my legs would allow it. I completed the last 5 mile section in 1:29:50, faster then the last two times on that part of the course, and finished in 31:46:20 (about an hour and a half better then last year). Below is a comparison of my times in the 2007 race compared to 2008. Except for the final loop, I completed each loop (and each section of each loop) faster than I did last year. Loop #4 (and each section in it) was at a slower pace. Yet, I still hit a solid time for the course, and put in a course PR. Way to hang, Tony!! Sounds like Sergio may have been channeling an ER nurse!! The F-bomb is a fave among us! Again, great job! Tony - what an amazing accomplishment. Thanks for inspiring me to reach higher running goals. Hope you are recovering well! Wow, way to go Tony! That was a very impressive run in not very good conditions (what is up with all the bad weather at ultra's this year?). P.P.S. have any hotel suggestions of places we should not stay in NC or can you only pick 'em in VT?? Great run! Must feel good to improve that much over last year and see the results of your training. Congrats, once again! Way to tackle GTR again... now rest that knee !! To climb that ski hill and go down those bone-jarring descents and endure hail, rain and wind --as if 100 miles wasn't hard enough. Great rr and photos!!! Very proud of you for smashing your 2007 time!!! Finally! I couldn't get in the other day to congratulate you again. My, my. An epic race that includes all four seasons. That Ginette sounds like a great pacer, and how cool to have your girls there to see what a terrific dad they have. I bet if they could, they'd bring you to school for Show & Tell (if they still do that in school? ).